Coastal cutthroat trout populate nearly all of the streams and lakes along the Pacific Coast rainforest belt, from Northern California to Prince William Sound in Alaska. 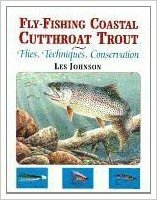 In this book, Les Johnson has written the definitive book on coastal cutthroat--from their habitat and life histories to the most productive flies, techniques, and tackle--always with a deep sense of responsibility towards the future of these great fish. Johnson's vast knowledge and love for this fish coupled with data contributed by biologists and academics from California, Oregon, Washington, Alaska, and British Columbia, make Fly-Fishing Coastal Cutthroat Trout the most in-depth book ever published on this feisty and tenacious trout. From a purchaser of the book: "I am intrigued by what others overlook. This book discussed a much ignored fish that is of great importance and a specific indicator of the overall health of our fishing industry in general. In 25 years of living in NorCal I have only hooked one cutthroat (not a hybrid). This book speaks of where and how to catch them. Habitat, feed, and habits. Good book for those less drawn to the stockers and size queens out there."